When anxiety and fatigue reach a critical point, then comes insomnia leaving behind you so many sleepless nights. A girl experienced this before her friend got married, so she asked for advice from a person who gives meditation classes. She advised her to lie in a supine position being comfortable and warm, then close the eyes, breathe deeply through the nose and inhale for 4 seconds. After that, hold the air for 7 seconds and begin to slowly drop the air through the mouth for 8 seconds. Repeat the whole procedure 4-7-8. While doing this, count the seconds for yourself and then follow the breathing procedure. 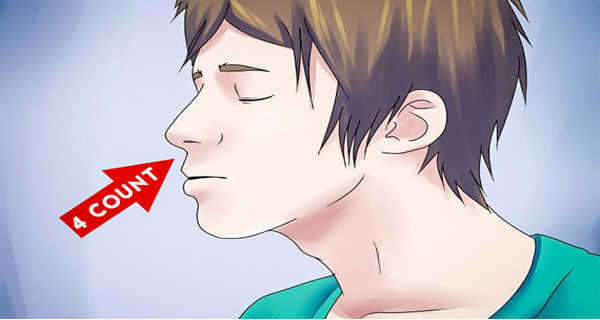 The exercises for breathing will reduce the heart rate and will calm your body. Even though it looks like a nonsense, it really works. When people are stressed out, worried, or anxious, the amount of adrenaline in the blood starts to rise, while breathing becomes shallow and fast. This method acts as a sedative. When the breath is being hold followed by slow exhalation the heart rate is being slowed down. Moreover, the method will calm the mind as well because of the counting and concentrating on breathing. You are not aware about that at that moment, but the nervous system starts to calm slowly and the feelings of concern start to disappear, relaxing the whole body as a result. This method with its speed and strength is similar to anesthesia. Further, a doctor of medical sciences at Harvard, named Andrew Weil, studied this technique and discovered that this method has been known by Indian yoga teachers for centuries and was used in meditation for achieving complete relaxation which denotes it being completely safe. So, if in case you wake up during the night and think long before sleep, or you are being nervous about something, try this method which will be of great benefit for you. This method needs to be practiced 2 times a day to perfect it and then use it every time you need it, recommends Dr. Weil.